Eggs Benedict has to be my all-time favorite breakfast. There’s something so soothing about slowly poaching each egg and carefully making the beautiful hollandaise sauce. Sometimes I don’t want all the fat in a regular hollandaise sauce though, and I make this simple mock version. It’s a combination of mayonnaise, sour cream, Dijon mustard, lemon juice and fresh dill. I blend it in either a food processor or blender and spoon it down over the poached eggs and sausage. I used Johnsonville sausage instead of ham for this version too, it’s a nice change-up. We eat breakfast for dinner at least once a week. It saves money, and well, we just love breakfast foods! Because it was at dinner, I served a simple salad of spring greens. This would also make the perfect springtime brunch treat to serve Mom this Mother’s Day. I used this gorgeous ScanPan to cook my sausage. The non-stick surface on this pan sure is an upgrade from my little Target special nonstick skillet. I made this sausage and eggs benedict as part of Johnsonville Kitchen’s Wake Up To Better Breakfast Promotion. And you can participate in this fun contest too! 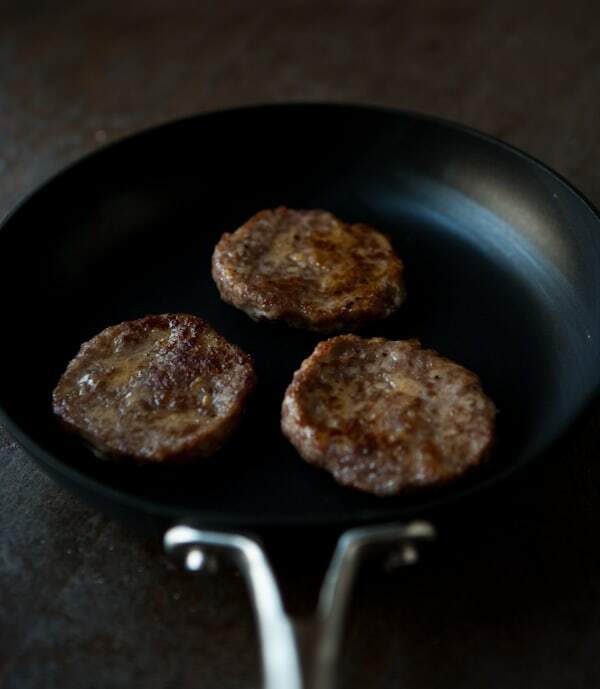 Just visit the Johnsonville Kitchens Facebook page and upload a photo and description of your creative breakfast recipe using Johnsonville breakfast Sausage. The grand prize winner will receive an 11 piece set of Professional Cookware from ScanPan. And did I mention the winner will also receive a and a year’s supply of Johnsonville Sausage! You can also share one of Johnsonville’s breakfast recipes with your friends, and you will be entered into a weekly sweepstakes drawing. Each week during the contest, one lucky winner will receive a five-piece set of Professional Cookware from ScanPan. For full contest details, visit the Johnsonville Kitchens Facebook page or Johnsonville.com. Brown Johnsonville breakfast sausage patties according to package directions. Bring a pot of water to a simmer. Swirl water and drop eggs in and cook each for about 3 minutes, or until done. Yolks will be runny. For the sauce combine mayonnaise, sour cream, lemon juice, Dijon mustard and fresh dill in a food processor. Pulse until dill is very fine and sauce is combined. 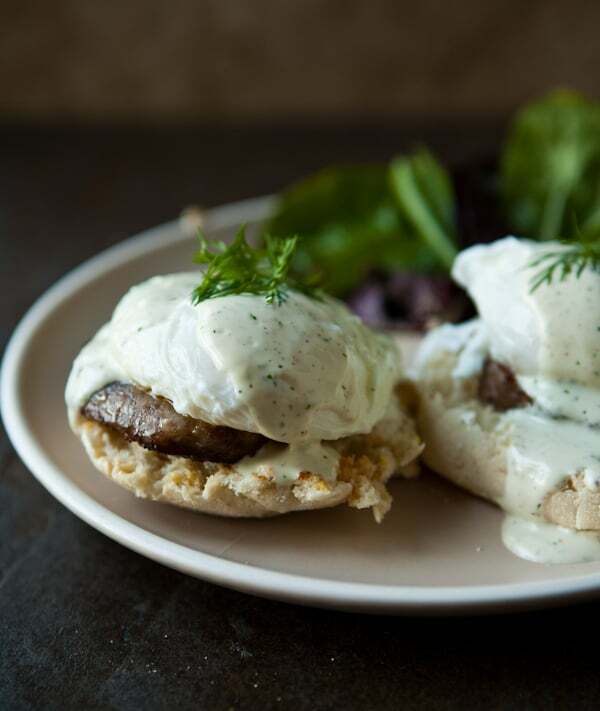 Break English muffins apart with a fork, top with cooked sausage, poached eggs, and drizzle with mock hollandaise sauce. Share your Johnsonville breakfast photos below in the comment section for a chance to win Johnsonville product coupons. I received the ScanPan shown above and product for this post, but no other compensation. All opinions 100% mine. 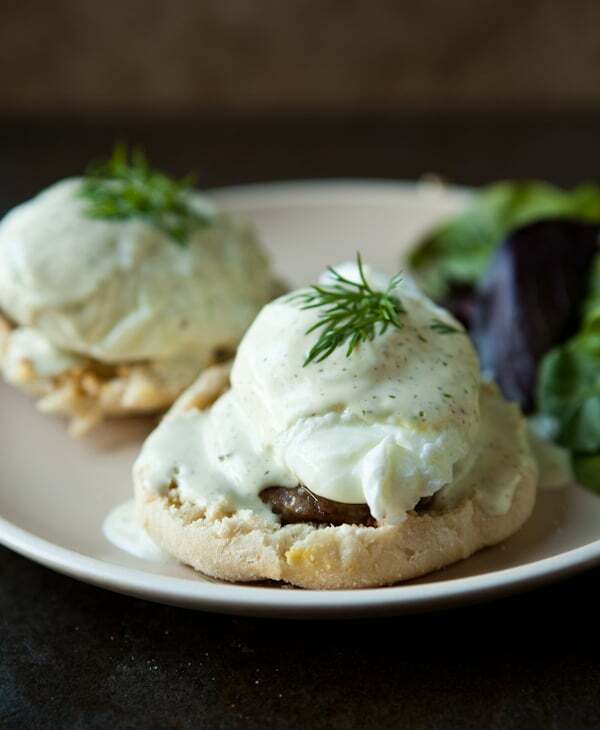 My hubby loves eggs benedict and I bet he’d love this recipe! 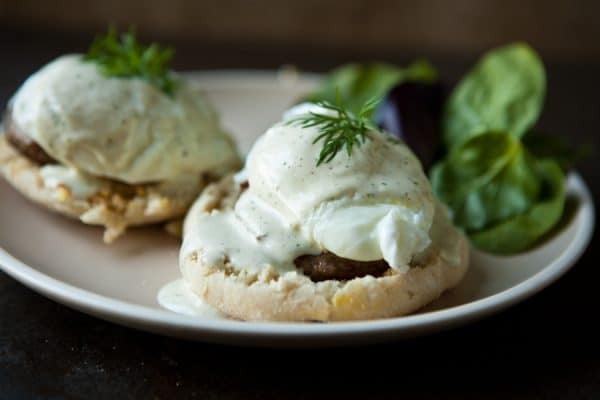 Eggs benedict is a favorite around here! These look amazing! What a great breakfast – great way to impressive early and late risers. I adore eggs benedict. This looks like a lovely easy version! Excellent idea with the mock hollandaise! Thanks! I didn’t have Dijon so I used mustard seeds & mayo and tasted ok too!